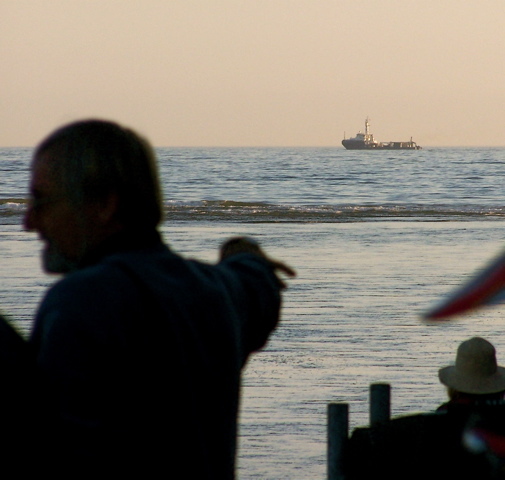 Bolinas residents watch private companies skim oil offshore after being told by sheriff’s deputies that they themselves were prohibited from cleaning up bunker oil that had washed up on the town’s beach. Some townspeople, however, concluded saving wildlife was more important than obeying a deputy. There are many lessons to be learned from Nov. 7’s 58,000-gallon oil spill in San Francisco Bay. The spill occurred when the container-cargo ship Cosco Busan struck the fender of a Bay Bridge tower, tearing a 100-foot-long gash in its hull. By now oil from the spill has drifted out the Golden Gate and traveled as far up the coast as Point Reyes and as far down the coast as Montara Beach in San Mateo County. Near Point Reyes, Drake’s Bay Oyster Company has had to stop harvesting and has said it could go out of business. This week The San Francisco Chronicle reported that as of Monday approximately 2,150 seabirds had been found dead or had died at rescue centers, leading ornithologists to believe the real death toll is closer to 12,500 birds. Ornithologists now warn that patches of bunker oil can be expected to wash up on coastal beaches for months to come. The toll on birds could get significantly worse, they note, because so many migratory birds winter here. Citing a lack of “resources,” federal and state scientists on Wednesday said they have already given up on trying to save roughly 250 oiled birds now dying on the Farallon Islands. For West Marin residents, the spill provided fresh evidence of the need to shake up the Pacific West Region of the National Park Service as soon as President Bush leaves office. From the Point Reyes National Seashore, to the Golden Gate National Recreation Area to Yosemite National Park, Pacific West Region law-enforcement rangers have in recent years become notorious for bullying and otherwise abusing well-intentioned members of the public. The Marin Independent Journal two weeks ago quoted Muir Beach resident Sigward Moser as saying that on Nov. 9 “he was threatened with a Taser gun, forced to the ground and handcuffed by a National Park Service ranger for refusing to stop cleaning up the oily beach beneath his home. Wearing protective gloves, Moser, a member of the Muir Beach Disaster Council, and a group of novice Buddhist monks from the Zen Center had already removed 3.5 tons of oil globs from the beach when he was arrested. Why didn’t the ranger want Moser there? The federal government, as usual, was paying private corporations to do public work, and volunteers by the thousands were turned away from Bay Area beaches. Public safety was a concern but one that was grossly overblown. Volunteers were at first told they would need 40 hours of training before they would be allowed to help. Eventually, the amount of training required for most volunteers around the Bay Area was reduced to four hours, but many volunteers were then told to go home and wait to see if they’d be needed in a month. Numerous townspeople ignored deputies’ orders and proceeded to clean large amounts of oil off Bolinas Beach. Unlike National Park Service law enforcement, sheriff’s deputies declined to arrest or manhandle good Samaritans and let them do their work. 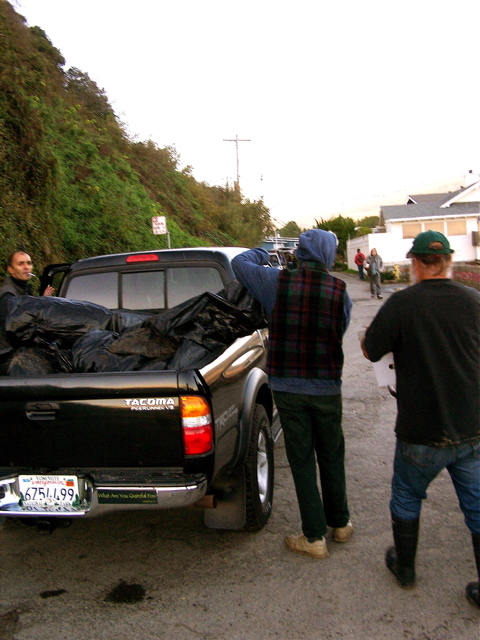 Here Mark Butler dumps a bag of rags used to sop up oil into a truck owned by Nidal Khalili of Bolinas (left) and his partner Joy Conway. Khalili and Conway planned to take the bags to a staging area in Stinson Beach. Coming off the beach at right is Walter Hoffman, who had just spent hours cleaning oil off sand and rocks. Particularly irritated by private companies being in charge of the cleanup effort was Stinson Beach Fire Chief Kenny Stephens. One cleanup company called Clean Bay had regularly practiced at Bolinas Lagoon, but it never showed up, Stephens noted. 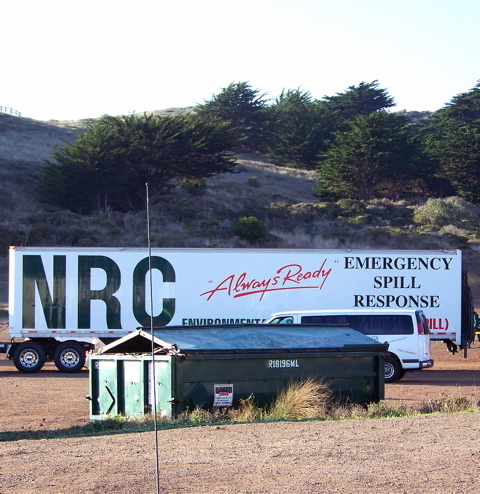 Finally a company call NRC arrived (above) “four days late and about 40 people short,” he added. 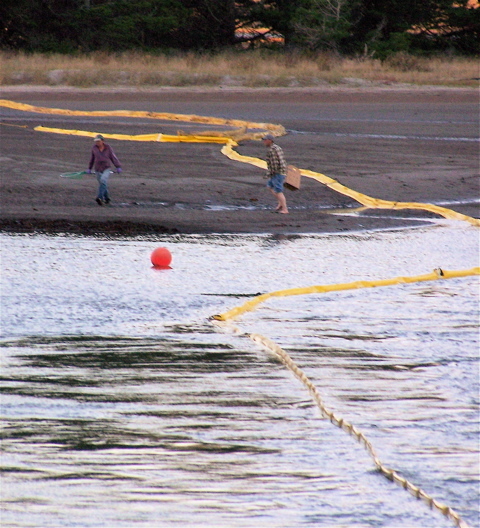 NRC was supposed to string a boom across the Bolinas Lagoon channel but didn’t know what to do. Stinson Beach and Bolinas residents during the much larger oil spill of 1971 had figured out how to erect a wooden boom across the channel mouth to keep oil out of the lagoon. NCR, however, tried to use foam-filled booms that broke every time the tide came in — even though Bolinas and Stinson Beach residents had already determined such booms (as seen here) wouldn’t hold up. After the fifth boom broke, NCR gave up. The volunteers above are on Kent Island within the lagoon. At the time, mired birds but no floating oil had come in off the ocean — although it has by now. Bolinas fisherman and other local residents, are familiar with currents and the contours of the channel, the fire chief said. However, he added, those running the cleanup “didn’t put local knowledge to use.” Residents wanted to get involved, “but our hands were tied,” Chief Stephens said. The only outside official who initially worked with the two towns, he added, was Brian Sanders of Marin Parks and Open Space. 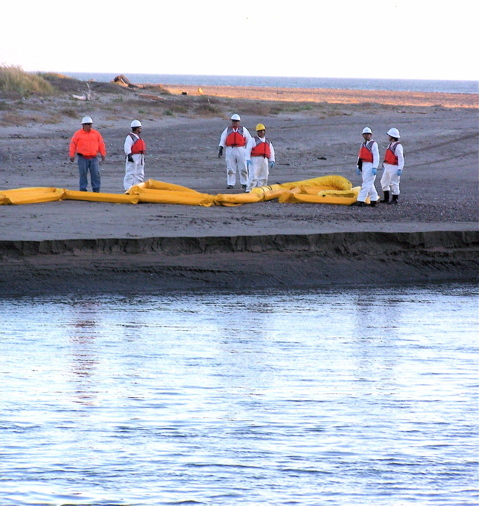 Northern California oil-spill-cleanup teams were so unprepared for even this medium-sized spill that “they’re tapped out of boom material,” Stephens said with amazement. 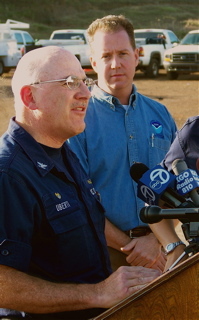 The chief credited Sanders with “doing a great job locating lots of stuff” for Bolinas and Stinson Beach to use in trying to contain the floating oil. On Nov. 11, the Bolinas Fire Department held a community meeting in which residents complained about members of the public not getting official cooperation when they cleaned oil from beaches. • Whether the pilot should have attempted to leave port in heavy fog when he had doubts about the ship’s radar. • Whether the pilot of the Cosco Busan was wrong in relying on the ship’s captain to interpret an electronic-chart system with which the pilot wasn’t familiar. • Whether there was a language problem between the local pilot and the Chinese crew. • Whether the Coast Guard should have warned the pilot sooner that the ship was heading toward a bridge tower. • Whether the tugboat accompanying the Cosco Busan could have been used to avoid the collision. • Whether freighters, like tanker ships, need double hulls. Congressional leaders, however, were unhappy with the answers they got from the Coast Guard and especially the National Transportation Safety Board, which said it would need a year to figure out what had happened. Irritated that the Coast Guard and the California Department of Fish & Game are now responsible for investigating their own behavior in the wake of the spill, House Speaker Nancy Pelosi remarked, “I don’t think they have the credibility to self-examine or self-investigate.” Pelosi, a member of the subcommittee, said Congress has now asked the inspector general of Homeland Security to conduct a separate probe. Sparsely Sage and Timely is powered by	WordPress 4.9.10 and delivered to you in 0.531 seconds using 50 queries.